The Obligate Scientist: Oh no! I (almost) missed IRFD, 2010!!! Oh no! I (almost) missed IRFD, 2010!!! Yikes! 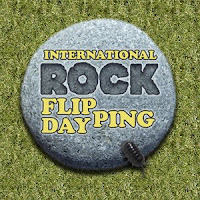 I somehow failed to recognize that today is International Rock Flipping Day, 2010! So what's a thesis-writing, easily distracted grad student to do? Why run outside and flip some rocks, of course. Pics will be posted below once I get them cropped and uploaded to the intertubes. Turns out, there aren't too many rocks worth living under in our yard - and the few that are are a bit on the huge end of the spectrum. Still, I managed to snap some decent photos of a few of the invertebrates living around our house. Pictures will be posted below tomorrow.